Virat Kohli made 104 and Mahendra Singh Dhoni an unbeaten 55 from 54 balls as captains past and present guided India to a six-wicket win over Australia in the second one-day cricket international on Tuesday, leveling the three-match series at 1-1. Kohli posted his 39th ODI century, his 24th in a second innings and his sixth against Australia, to lead a perfectly measured run chase which saw India surpass Australia's total of 298-9 with four balls to spare. He put on 82 in 13 overs in a critical partnership for the fourth wicket with Dhoni, which steered India at a cautious pace towards a winning total but he was out at a critical moment, with his team still needing 57 from 38 balls. Former captain Dhoni played a subdued role in support of his successor Kohli as two players with the joint experience of more than 550 ODIs steadily chipped away at Australia's total. With Kohli's untimely dismissal, Dhoni took up the chase and carried India to a victory which will see the series decided on Friday in the third international at Melbourne. 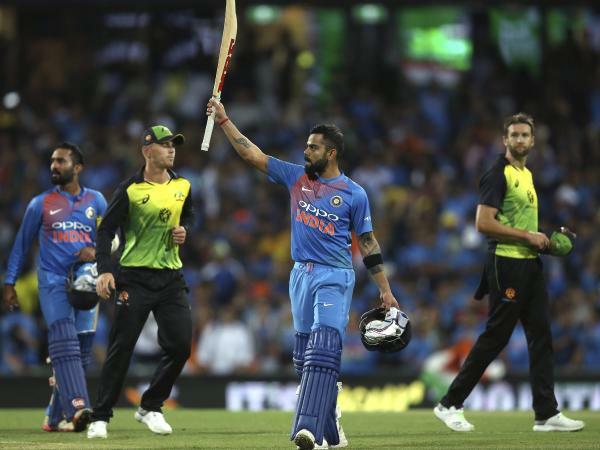 India came to the final over needing seven runs to win and Dhoni smashed the first ball over the long straight boundaries at the Adelaide Oval for a six which tied the scores, then clinched the win with a single from the next ball. India was ahead of Australia's scoring rate for much of its innings, though it became a little bogged down during the partnership between Kohli and Dhoni. Australia was successful in staunching the flow of boundaries and Dhoni hadn't hit a four or six in the time he batted with Kohli, preferring to take singles to yield the strike to the younger man. Kohli evinced every confidence in his ability to manage the chase and he seemed unconcerned when the run rate required crept up above eight, though with plenty of overs at India's disposal. He had just begun to step up his scoring rate, taking 13 runs from an over from Jason Behrendorff when he was out. At that point the match was still in the balance and it was clear Dhoni had to find a way to beat Australia's restrictive field settings. He announced his intention to do so with a six from the last over bowled by offspinner Nathan Lyon, which signaled to the many India fans in the crowd that the chase was in good hands. But Dhoni, now 37, looked close to exhaustion at times late in his innings, slumping to the ground and receiving treatment from the India team physio with two overs remaining and India still needing 16 runs. Dhoni was fortunate to have the heady support of Dinesh Karthik, who came to the crease at a difficult moment when Kohil had just fallen. He scored 25 from just 14 balls to ensure India reached its target. "It was a pretty tight finish," Karthik said. "They were bowling some good areas and we absorbed pressure well. "Credit to Virat and Dhoni, the way they played. We got a good start as well so it's the sort of win that will give the team a lot of confidence, chasing 300. "(Dhoni) has been doing it for years now and the fact he can stay calm, the fact he can absorb pressure and watch the ball, keep the plan very simple. You need the big shot and then he delivers." Earlier, Shaun Marsh produced a magnificent innings of 131 from 123 balls to guide Australia as it batted after winning the toss. He batted through the greatest heat of the day, as temperatures soared past 40 degrees, but he never wilted. He built Australia's total through moderate partnerships with Usman Khawaja (21), Peter Handscomb (20) and Marcus Stoinis (29) before launching a final assault on India's bowling with Glenn Maxwell, who hit 48 from 37 balls. Australia looked headed for a total well in excess of 300 but lost four wickets, including those of Marsh and Maxwell, for three runs in the 48th and 49th overs. "India outplayed us," Marsh said. "The finish (of the Australia innings) was a little disappointing but that's cricket. "I thought 298 was a competitive total out there but unfortunately India was too good."